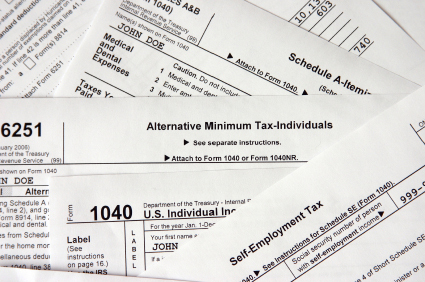 The Alternative Minimum Tax (“AMT”) was enacted in 1969 to ensure that high-income individuals paid at least a minimal amount of tax. The AMT operates parallel to the regular tax system and allows different deductions, credits, and exemptions. Calculating the AMT can be a complex process. In short, however, AMT is computed by subtracting the AMT “exemption amount” from a taxpayer’s alternative minimum taxable income (“AMTI”).1 The excess, if any, is subject to AMT rates of 26% or 28%.2 A taxpayer must pay the greater of their regular tax liability or AMT liability. When the AMT was created, Congress did not index the exemption amount for inflation. Due to that flaw, the AMT required constant Congressional action (i.e., “patches”) to increase the exemption amount and prevent the AMT from hitting unintended taxpayers. 2012 was no exception to the “patch” requirement. Without a “patch,” the 2012 exemption amount would have decreased to the low levels of 2000 (i.e., $33,750 for single filers), thereby subjecting millions of middle-income taxpayers to the AMT. $39,375 for married taxpayers filing separately. To prevent upper-income taxpayers from benefiting from the AMT exemption amount, Congress has phased out the exemption amount if a taxpayer has AMTI above a threshold level. The chart below illustrates the 2012 AMT exemption amount phase out. If you have questions regarding the AMT or ATRA, please contact a Foster Swift tax attorney. 1 AMTI is calculated by taking a taxpayer’s regular taxable income and (a) adding or subtracting AMT adjustments, and (b) adding AMT preferences. 2 For single filers, the excess up to $175,000 is taxed at 26%. The excess above $175,000 is taxed at 28%.